Optimal working dilutions should be determined experimentally by the investigator. Suggested starting dilutions are as follows: IHC-P (1:100-1:300), IF (1:200-1:1000), ELISA (1:20000). Not yet tested in other applications. 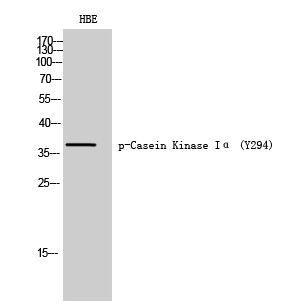 CSNK1A1L (Casein Kinase 1 Alpha 1 Like) is a Protein Coding gene. Among its related pathways are Translation Insulin regulation of translation and Wnt signaling pathway (KEGG). GO annotations related to this gene include transferase activity, transferring phosphorus-containing groups and protein tyrosine kinase activity. An important paralog of this gene is CSNK1G2. 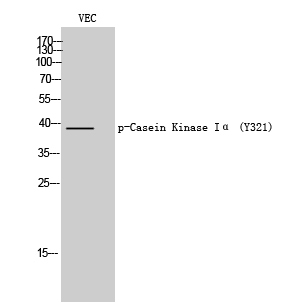 asein kinases are operationally defined by their preferential utilization of acidic proteins such as caseins as substrates. It can phosphorylate a large number of proteins. Participates in Wnt signaling (By similarity). 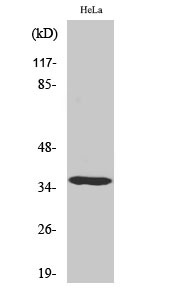 Casein Kinase I α1/1L Polyclonal Antibody detects endogenous levels of Casein Kinase I α1/1L protein.